While NRA leaders embraced her, Butina denounced US sanctions and advised a militia group helping Putin seize Crimea. The American public has continued to know little about Maria Butina, who pleaded guilty in December to participating in a foreign conspiracy against the United States. Not much has emerged about the confessed Russian agent’s political activities beyond her efforts to build ties with Republican leaders and top officials of the National Rifle Association. But Butina wasn’t just a gun rights fan who attended American University, romanced a veteran Republican operative, and pitched US-Russian collaboration at NRA conventions. Mother Jones has uncovered a trail of activity showing that during the same period when top NRA leaders welcomed Butina into the fold—meeting with her extensively in Moscow and the United States—Butina actively supported Russian President Vladimir Putin’s military takeover of Crimea. In the immediate aftermath of the invasion and annexation in March 2014, Butina denounced retaliatory sanctions by the Obama administration and traveled to Crimea to promote the arming of pro-Russian separatists. Her efforts there included pledging support to a leader of a militia group that violently seized a Crimean news outlet it deemed “pro-American” and swiftly repurposed for a Kremlin propaganda operation. As multiple congressional probes of NRA ties with Russia intensify, the NRA now says it had no official connection to a trip NRA leaders took to Moscow to meet with Butina’s gun group and Kremlin officials—a claim that Democratic Sen. Ron Wyden, who is leading one of the probes, calls “not credible.” Butina’s role in Crimea raises additional questions about why the NRA—known historically for its hawkish “freedom loving” image—spent years getting close with a Russian national who was doing work hostile to US national security interests. By late 2013, NRA leaders had already forged ties with Butina’s boss, Alexander Torshin, a high-level official from Putin’s party who was hosted by NRA board member and past president David Keene at NRA annual conventions. (Torshin was sanctioned by the US government last April and described as an unidentified co-conspirator in Butina’s indictment.) 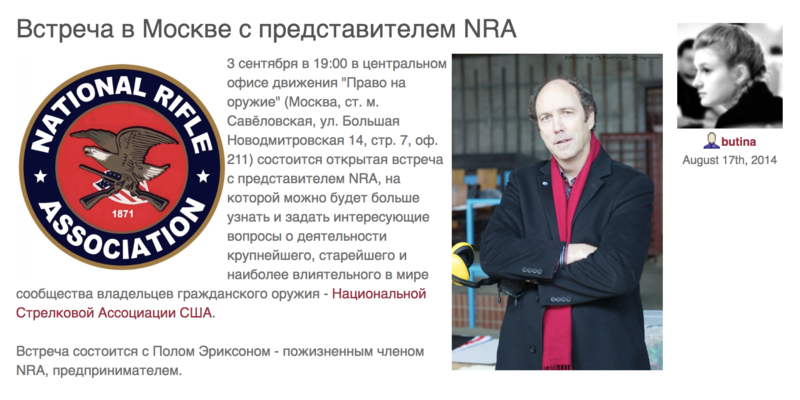 In November 2013 Keene traveled to Moscow, where he gave a speech to Butina’s fledgling group, the Right to Bear Arms, offering to “work together” to advance common interests. 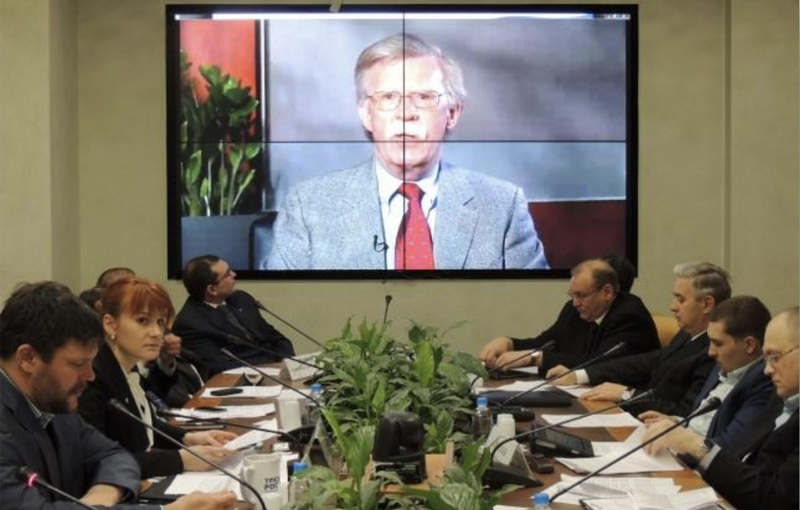 Also at that time, future Trump national security adviser John Bolton, then a member of the NRA’s international affairs subcommittee, recorded a video address to the Russians talking up gun rights, which Butina used to lobby the Russian legislature. Butina had been cultivating partnerships with gun rights groups internationally—but four months later, she mobilized to expand her group into Crimea in a starkly different context. On March 17, 2014, after Putin sent in troops and used an illegal referendum to declare Crimea part of the Russian Federation, President Barack Obama announced sanctions in response, including against entities operating in the Russian arms sector. That same day, Butina posted a lengthy commentary online warning that the Obama sanctions would “bankrupt the Russian arms industry,” calling them “a direct threat to national security.” She soon announced plans to travel to Crimea the following week to establish offices for her group there and advise local citizens on arming themselves under Russian law. Butina stated in the local press that “security problems” in Crimea would persist and that there was a need to develop civilian “self-defense units” to help uphold the new Russian order. Butina held her press conference with the pro-Putin militia at their newly seized media headquarters. Four weeks later, she was warmly welcomed by the NRA. The Crimean Front was involved in more than self-defense. When Putin’s annexation began, Veselovsky had led a “Cossack self-defense unit” to storm the offices of the independent Crimean Center for Investigative Journalism. As seen in video posted on March 1 that year by other local media, the group of about two dozen men clad in camouflage uniforms and balaclavas marched in formation to the building and demanded entry. Two of the masked men then hurled a concrete block through a front window and the group forced its way inside. The journalists fled to Kiev as the militia group denounced the influence of “American agents” and recast the outlet as “News Front.” Reportedly funded by the Russian security services and since run by an editor who helped seize the offices, the outlet publishes stories attacking US sanctions and special counsel Robert Mueller’s investigation, among other anti-American content. Since Donald Trump became president, News Front has also touted ties with Natalia Veselnitskaya, the Kremlin-linked lawyer who attended the infamous June 2016 Trump Tower meeting and was recently indicted. After news emerged that top Trump campaign officials sought to acquire “dirt” on Hillary Clinton at that meeting, News Front provided “exclusive” documents to the American press purportedly showing that Veselnitskaya had no such material. Butina held her March 2014 press conference with the Crimean Front at their newly seized media headquarters. Four weeks later, she traveled to Indianapolis for the NRA annual convention, where NRA executives welcomed her as a VIP. Over several days in Indianapolis, Butina was personally hosted by Keene and former NRA President Sandy Froman, attending events including leadership meetings and a fundraising dinner for the gun group’s elite “Golden Ring of Freedom” million-dollar donors. 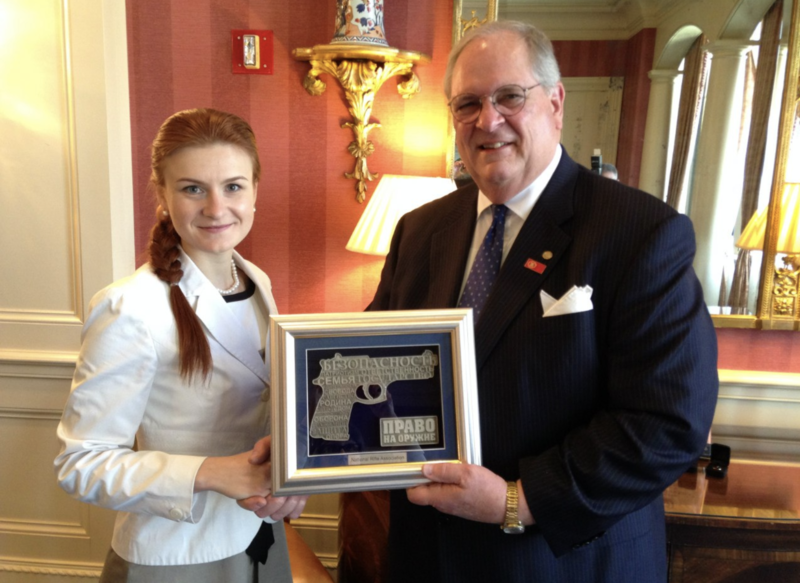 In a blog post she published while there, Butina included photos of herself at an upscale hotel with Keene, Froman, and then-NRA President James Porter, to whom she gifted a Right to Bear Arms plaque. Other NRA figures she interacted with included CEO and executive vice president Wayne LaPierre, top donor Joe Gregory, and Milwaukee Sheriff David Clarke. Evidently they had already cemented a relationship, according to Butina herself: Six months earlier, she told an Israeli audience that her gun group had entered into a “signed cooperation agreement” with the NRA, as Mother Jones and the Trace reported recently in a joint investigation. (An NRA spokesman would not confirm whether that agreement existed, responding only that the NRA was “not aware of any such agreement.”) According to a recent report in the New York Times, the NRA “repeatedly brought Butina from her native Russia to the United States for events until she obtained a student visa in August 2016.” And Butina and Torshin were the only Russian nationals who were “life members” of the NRA, according to a tweet Torshin posted right as Trump won the November 2016 election. Keene did not respond to a phone call or emailed questions. Butina, who is reportedly cooperating with federal prosecutors, is scheduled to appear in court for her next hearing on February 12. An attorney for her, Robert Driscoll, declined to comment. At a rally in Moscow, Butina gave a speech starkly different than how she comes across in video of her captured stateside. Following the April 2014 convention in Indianapolis, Butina traveled to NRA headquarters in Fairfax, Virginia, where she visited the NRA gun range and museum with Keene and others and posed for a casual photo with Keene in front of the group’s flagship glass office tower. A few weeks later, she was back home actively promoting Putin’s territorial conquest. 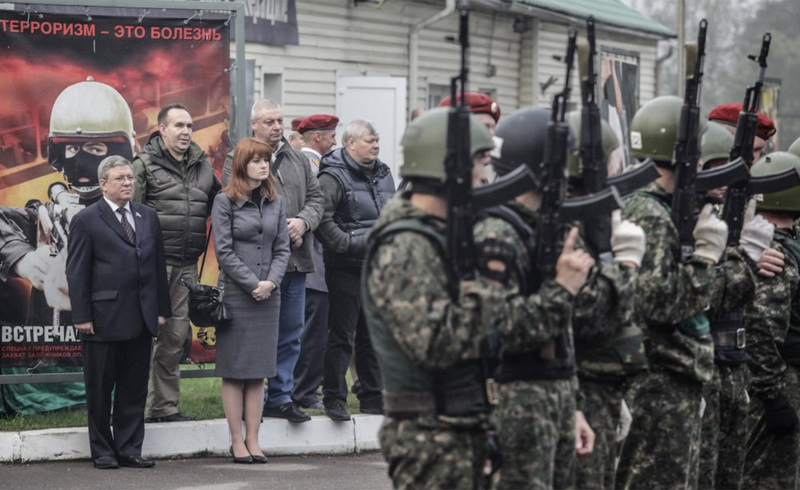 Eight days later, Butina returned to Crimea, this time hosting events in partnership with a gun company based in Moscow, to promote the arming of locals under Russian law. She returned again in early August for a similar event. By the following spring of 2015, with Erickson’s help, Butina was setting her sights on a graduate program at American University and giving speeches to student groups in Erickson’s home state of South Dakota. (Erickson, who later tried to connect the Trump campaign with the Kremlin through Butina, is reportedly the target of a related federal probe, and was indicted on February 6 on unrelated fraud and money laundering charges.) In April 2015, Butina returned to the NRA annual convention, this time in Nashville, her second of three alongside Torshin. And come that summer of 2015, Butina would make her first direct contact with a Republican presidential campaign. During an audience Q&A at a political conference in Las Vegas, she asked about foreign policy. Specifically, she wanted to know whether the candidate at the podium might back off from “damaging” US sanctions against Russia. The answer Donald Trump gave Butina was yes. It was an outcome signaled by the future president that, in more than one case, has since come to pass. Translations from Russian by Hannah Levintova.